Newsweek’s official Twitter account has been compromised by individuals claiming to be members of a pro-Islamic State hacker group, Cyber Caliphate, which previously has been attributed with targeting the military and other media outlets. On Tuesday, the profile picture associated with Newsweek’s official Twitter page was altered to that of a masked man alongside the words “CyberCaliphate” and “Je su ISIS,” and posts were broadcast to the account’s 2.51 million followers that included threats to the Obama family and screenshots of what appear to be sensitive military documents. “In the name of Allah, the Most Gracious, the Most Merciful, under the flag of the Islamic State CyberCaliphate continues its CyberJihad,” reads a statement included in one of the tweets sent out by the compromised @Newsweek account on Tuesday. The Newsweek account has since been restored and questionable posts have been purged, but not before the hackers managed to post a handful of tweets, including one aimed at the first family of the United States and others linking to images purportedly lifted from pilfered military documents. 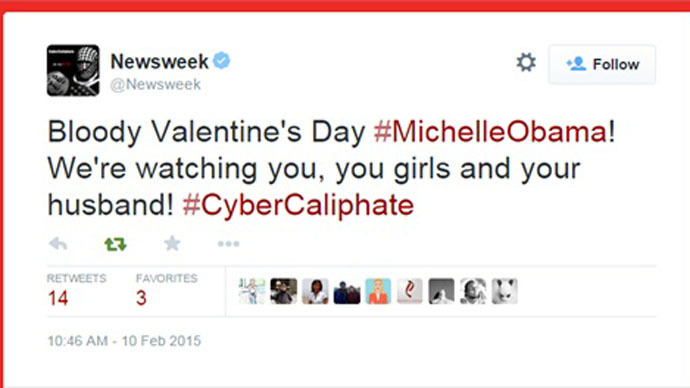 “Bloody Valentine's Day #MichelleObama! We're watching you, you girls and your husband! #CyberCaliphate,” read one Twitter post. The hacked account also directed followers to a website where several documents are hosted, including completed application forms for programs offered by the Defense Cyber Investigations Training Academy program, a branch of the Air Force Office of Special Investigation, which contain personally identifiable information pertaining to military personnel and at least one employee of the National Security Agency. Other documents are marked “For Official Use Only,” and one contains the email addresses and phone numbers of dozens of people with .mil accounts. “The Islamic State is already here, CyberCaliphate got into your PCs. We know everything about you and your relatives and we’re much closer than you can even imagine,” reads a message on the website where the documents are hosted. Last month, the FBI acknowledged it was investigation incidents in which the social media accounts of the Albuquerque Journal and Maryland's WBOC 16 network were compromised by individuals claiming to be involved with CyberCaliphate. The group didn’t made international headlines, however, when it took control of the Twitter account registered to the US Central Command on January 12.